I gave the following talk at the Caux Forum for Human Security in Montreux, Switzerland, on July 13, 2011. The commons is, at its core, a very old – and a very new, recently rediscovered – system of governance for managing resources. It has deep roots in history as a system of self-provisioning and mutual support. It is also a way of being a human being that goes beyond the selfish, rational, utility-maximizing model of homo economicus that economists say we are. The commons presumes that humans are more complex, and that more holistic, humane types of human behavior can be “designed into” our governance institutions. In its largest sense, the commons is about stewardship of the things that we own in common as human beings. It’s about ensuring that we protect them and pass them on, undiminished, to future generations. Let me add, the commons is also a growing trans-national movement that manifests itself in many different ways. The commons extends from cyberspace to the many commons of agro-ecological knowledge managed by indigenous peoples. It reaches from the world’s city squares and parks that are the cradles of community, to the vast repositories of information and creative works that must be shared if they are to be kept alive. The commons can be seen in new local food production systems that farmers and households are inventing…. and in alternative local and digital currencies that are emerging all over….and in the subsistence commons of forests, fisheries and farming that meet the every day needs of an estimated two billion people in the world. The strangest thing is, because these forms of provisioning exist outside of both the State and the Market, they are essentially invisible. They are not seen as valuable because they have little to do with private property rights, markets or geo-political power. But below the radar screens of mainstream culture, the reality is that the commons is in fact a significant force in the world today. It always has been, of course, because the commons is arguably as old as humanity. But now it’s becoming more visible. The challenge for us today is to see the commons– and to find new ways to support and protect it. This dogma has held sway in the popular mind and among economists since 1968, when biologist Garrett Hardin wrote a famous essay called “The tragedy of the commons.” It was a convenient parable because it implied that only a regime of private property rights and markets could solve the tragedy of the commons. If people had private ownership rights, they would be motivated to protect their grazing lands. But Hardin was notin fact describing a commons. He was describing a scenario in which there were no boundaries to the grazing land, no rules for managing it, and no community of users. But that’s not a commons. That’s an open-access regime, a free-for-all. 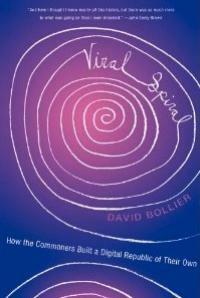 A commons has boundaries, rules, monitoring of usage, punishment of free-riders, and social norms. A commons requires that there be a community willing to act as a steward of a resource. Hardin’s misrepresentation of the commons stuck in the public mind, however, and became an article of conventional wisdom, thanks to economists and conservative pundits. For the past two generations the commons has been widely regarded as a failed paradigm of governance. Two of the leading introductory economics textbooks in the U.S. fail to even mention the commons. Professor Elinor Ostrom of Indiana University was the most prominent academic to rescue the commons and rebut Hardin. It took years of painstaking field research and innovative theorizing, but in her pathbreaking 1990 book, Governing the Commons, Ostrom identified some basic design principles of successful commons. Over the past several decades, she and many colleagues have shown in hundreds of studies that people can and do successfully manage their land and water and forests and fisheries as commons. Some have done so for hundreds of years, such as the Swiss villagers who manage high mountain meadows and the huerta irrigation institutions in Spain. Ostrom’s great achievement has been to buck the established wisdom of mainstream economics while spawning a fertile field of study that combines political science, sociology and economic and other social sciences. She won the Nobel Prize in Economics in 2009 for this work. I should perhaps interject here that a commons is not a resource in itself. It’s a resource plusa social communityand the social values, rules and norms that they used to manage the resource. They’re all an integrated package. Call it a socio-economic-biophysical package, sort of like a fish and a pond and aquatic vegetation: They all go together and don’t make sense as isolated parts. That may be why conventional economics has so much trouble understanding the commons. It doesn’t understand how the community, rather than the individual, can be the framing term of reference. The commons looks at the whole and regards the individual and the collective as nested within each other. This is a very different metaphysics than that of market individualism. The commons is also a threat to conventional economics because it asks us to entertain a broader definition of value than money. It asks us to entertain a larger conception of “the economy” than Gross Domestic Product. Needless to say, this doesn’t go down well with economists who like to boil everything down to numbers and bottom lines, and policymakers who may care more about measurable results than the complex human processes for getting us there. Economics is about creating wealth. But only a certain kind of wealth – wealth that has a price attached to it and can be traded in the marketplace. Economic value is said to be created when two parties truck and barter in the marketplace and come to an agreement to trade cash for goods or services. This kind of wealth is usually encased in private property rights. The more market activity there is, the more “wealth” that is created and the happier we supposedly are. The only problem with this standard economic narrative is that it doesn’t have much to say about the great stores of value that don’t have price tags. How much is the Earth’s atmosphere worth? What about the human genome? Fresh water supplies? Our inheritance of scientific knowledge and culture? Parks and open spaces? The Internet? These are huge chunks of wealth that matter a great deal to our lives. Now, sometimes these chunks of wealth are given the label of “public goods” and governments may decide to take care of them. Maybe. Sorta. But if they don’t make money for someone in the marketplace, well, they are likely to be neglected, the way that libraries and public education and public health are. The lack of a price tag typically means that these things exist outside of the marketplace. Philosopher John Locke called such things res nullius. Nullities. They’re free for the taking because no one has any exclusive property rights in them and there is no price for them. All you have to do is “add your own labor” and you’re entitled to own them. That’s basically the philosophical justification that conquerors and colonizers have used to claim ownership of native lands – and, in our time, to claim ownership of native people’s ethno-botanical knowledge, and of genes and lifeforms and synthetic nano-matter. It’s also the kind of logic used by industrial trawlers that vacuum up all marine life in vast stretches of the ocean. The great unacknowledged scandal of our time is the large-scale privatization and abuse of dozens of resources that we collectively own – our commons. They are un-owned and “without price.” Priceless, you might say. Over the course of several centuries, but especially in the 19th Century, the English aristocracy colluded with Parliament to privatize the village commons of England. The commons was essentially dismantled. Enclosure was a way for the landed gentry to make a lot of money and consolidate their political and economic power at the same time. Today’s enclosure movement is an eerie replay of the English enclosure movement as international investors and national governments buy up farmlands and forests in Africa, Asia and Latin America on a massive scale, in collusion with host governments. Instead of commoners having local authority to grow and harvest their own food, they are being thrown off their lands that they have used for centuries -- so that large multinational corporations and investors can sell food to global markets, or make a speculative killing on their land investments. Can you guess what happens to the millions of people who suddenly can’t survive because their commons have been enclosed? They become the characters of a Charles Dickens novel. They are forced into cities to search for a livelihood and end up becoming beggars, shanty-dwellers and exploited wage-slaves. A large number of Somali pirates who began attacking ships used to be fishermen in the coastal waters off Somalia until foreign industrial trawlers drove them from their fisheries – and destroyed their fishing commons. Nowadays, it’s not just land and oceans being enclosed. Mathematical algorithms can now be owned if they are embedded in software and supposedly serve a novel commercial function. McDonald’s claims a trademark in the prefix “Mc,” so that you can’t name your restaurant McSushi or McVegan or your hotel McSleep. The American music licensing body ASCAP once demanded that hundreds of summer camps for boys and girls pay a blanket “performance license” for singing copyrighted songs around the campfire. These are not exceptional cases, mind you. 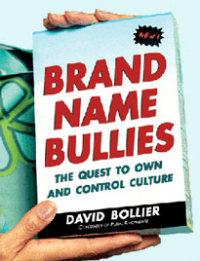 I wrote a book about them in 2005, Brand Name Bullies: The Quest to Own and Control Culture. One of the biggest commons around is the Internet. It is vulnerable precisely because it is a commons. As we see in authoritarian countries such as China, and Egypt – and in the Obama administration’s vendetta against WikiLeaks --governments don’t necessarily want the commoners to have the freedom to communicate freely among each other. Telecom companies would prefer to convert the Internet into a proprietary shopping mall by doing away with net neutrality rules. Hollywood and the record industry would like to make peer production and sharing illegal by expanding the reach of copyright law. I’ve barely ventured into the vast range of enclosures that are going on today, but here’s a brief sampling: the atmosphere, the oceans, genes, taxpayer-funded research, public spaces in cities, public highways and airports that are becoming private property, groundwater supplies, and much else. Market enclosure is about dispossession. It is a process by which the powerful convert a shared community resource into a market commodity, so that it can be privately owned and sold in the marketplace. Enclosure preys upon the common wealth by privatizing it, commodifying it and dispossessing the commoners of their autonomy and resources. Enclosures sweep aside the social relationships and cultural traditions and sense of community that had previously existed. It requires the imposition of extreme individualism, the conversion of citizens into passive consumers, and greater social inequality. Money becomes the coin of social legitimacy and participation in a society. The most serious and urgent problem may be the enclosures of nature. Markets have a propensity to treat Nature as either as a nullity or as a commodity that can be treated as a brute object – something that has no life in it, no dignity, no connection to God’s creation. Biotech companies and universities now own one-fifth of the human genome. The biotech company Myriad Genetics of Salt Lake City claims a patent on a “breast cancer susceptibility gene” that guarantees it monopoly control over certain types of research. This means that the patent is actually preventing other scientists from researching genetic sources of breast cancer lest it violate the patent. One of the first attempted privatizations of water supplies came in Cochabamba, Bolivia, in 2000, when the Bechtel corporation and the government privatized the municipal water supply and even claimed ownership of rainwater. More recently, the billionaire T. Boone Pickens has spent more than $100 million acquiring groundwater aquifers in the Texas High Plains, which could make it very expensive for many communities there to survive as water becomes a private, proprietary product. The biggest enclosure of nature is arguably the manmade carbon pollution that is accelerating climate change. A complex topic unto itself. But it points up a core problem with modern-day economic theory – the inability of the economy to differentiate between growth in the volume of market activity and healthy, socially beneficial development that can be ecologically sustained. GDP confuses material “through-put” in the Market Machine as equivalent to human progress. It’s just not so! There are two reasons. First, GDP doesn’t measure the common wealth – the stuff that is “off the books” and belongs to all of us, which is supposedly “free for the taking.” And second, GDP never takes into account the incredible amounts of illth that the economy creates. Here’s the problem: The economy takes from the commons – in the form of free or discounted access to our shared resources. And then, whatever can’t turned into private profit is dumped back into the commons, as illth. Politicians and economists love to crow about how much wealth is being created – but they systematically ignore how much illth is being created in the process. They count only the market wealth. So we have the perverse situation in which we need to create ever-rising amounts of illth just to create more wealth. And we are told that we can neversolve our social problems – healthcare, education, social justice – unless we create more wealth. Call it the Red Queen’s Madness. As the Red Queen told Alice in the book Alice in Wonderland, she had to keep running faster and faster just to stay in the same place. The Red Queen’s Madness is now the very basis for our global economy. We need to keep extracting more and more finite natural resources faster and faster just to maintain the same standard of living – while creating ever-increasing amounts of illth that no one wants to confront. Consider global warming: scientists warned twenty years ago that this would be a problem, and very little has been done to deal with this looming planetary catastrophe. Of course, national governments always aspire to set limits – and corporations are always pledging to “go green” or at least market themselves as green. But let’s be frank: History has shown that neither the Market nor the State has been very successful at setting limits on market activity. The simple truth is, neither really wants to. Growth is what props up the economy and growth is what props up national governments. Setting limits on market exploitation of nature or culture or labor would only slow economic growth, diminish profits and reduce tax revenues. Which is why the tragedy of the commons should really be renamed, “the tragedy of the market.” The Market/State is largely incapable of setting limits on itself or declaring that certain elements of nature or culture or community should remain inalienable. This brings me back to the commons. One reason that I am so attracted to the commons is it gives us a vocabulary for imagining a new sort of future. It lets us develop a richer narrative about value than the one sanctioned by neoliberal economics and policy. The commons helps us see that we are actually richer than we thought we were. It’s just that our common wealth is not a private commodity or cash. It’s socially created wealth that’s embedded in distinct communities of interest who act as stewards of that wealth. Because the value is socially embedded, it can’t simply be bought and sold like a commodity. The commons can be generative in its own right – but the wealth it generates is usually shared, non-monetized value. Think of the hundreds of millions of photos on Flickr or the millions of Wikipedia entries in over 160 languages. Think of the more than 6,000 open-access academic journals that are bypassing expensive commercial journal publishers. Think of the Open Educational Resources movement that is making open textbooks and the OpenCourseWare movement started by M.I.T. Think of the hundreds of millions of online texts, videos and musical works that use Creative Commons licenses to enable easy sharing. Think of the vast free and open source software community that is the basis for a rich and varied commercial software marketplace. There are countless such digital commons based on peer production and sharing. In fact, the bestiary of commons is now so large and varied that there is what amounts to a Commons Sector for knowledge, culture and creativity. Natural resource commons can also quite generative even though they are dealing with finite, depletable resources. There are all sorts of successful commons for managing fisheries and forests and irrigation. There are the acequias for water in New Mexico. The ejidos in Mexico. Native American lands and their sacred relationships with Nature. The commons is exemplified by traditional seeds and farming methods that Indian farmers use to avoid expensive proprietary seeds that have been made artificially sterile and the require synthetic pesticides and fertilizers. The Indian activist Vandana Shiva has done heroic work in this area. The commons is exemplified by researchers who generate and share gene sequences for the human genome; and by the community gardens of New York City that feed people nutritious food and improve property values in the neighborhood; and by the Slow Food movement, Community Supported Agriculture movement, the Transition Town movement, and many others. When we start to see the commons from this angle, we see that there is no tragedy of the commons. 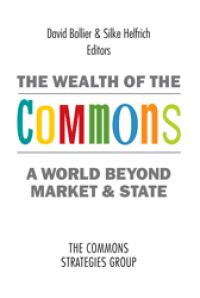 The commons offers a value-proposition that neither the Market nor the State can provide. The particular governance structures for generating this value differs from one class of commons to another. Subsistence commons do it differently than digital commons. The so-called gift economies such as blood banks, academic disciplines and Couchsurfing differ from urban commons such as community gardens and public squares. But what all commons have in common is an ability to manage shared resources and invite participation and inclusion. They rebuild a social fabric that neither the market nor the state is capable of rebuilding. This is the healing logic of the commons. an ability to declare that certain resources are inalienable – that is, off-limits to markets. Now I hasten to add that the commons is no panacea. Commons often fail because of bad leadership or inappropriate governance structures. Just look at the many failed fisheries and forest commons in poor countries. Commoners have plenty of disagreements and conflicts. One key lesson to be learned from scholarship about commons is that their contextmatters a great deal. Their particular history, traditions, social practices, political circumstances, the specific resource, and much else, can make or break a commons. So please don’t let me leave with you the impression that the commons is somehow a magic bullet that is somehow exempt from the frailties of humanity and history. Unfortunately, commons are more vulnerable than they need to be -- because the Market/State often regards them as a competitive threat. After all, the commons gives commoners some measure of autonomy and control over their lives and resources. Corporations and governments don’t always like that. The commons lets people wean themselves away from an unhealthy dependency on volatile or predatory markets. It lets people escape the indignities of charity and government handouts. As a commoner, you don’t necessarily need to buyseeds or software or books or water from a company. You can get them for free, or inexpensively, through your seed-saving collective….and from your free software network…. and from the public library…. and from your water collective or municipal water system. Moreover, as a commoner, you are entitledto these things. As I said, the commons is not a magic wand. It’s simply an opening, a pathway, a scaffolding to build anew. Indeed, a commons works only if there are commoners participating in it. Or as the great scholar of the commons historian Peter Linebaugh puts it, “There is no commons without commoning” – the social practices and ethics that sustain a commons. The commons is a verb, not just a noun. It is not something that we just hand off to politicians and bureaucrats. 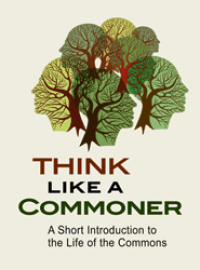 You could say that commoning is a new species of citizenship and a new ethic. But how can we actually promote commoning? It won’t be easy. The Market/State, as I mentioned, tends to regard the commons with indifference or hostility. Fortunately, there is a lot of energy pushing the commons forward. The many different “trans-national tribes” of commoners are starting to discover each other: the free software programmers, the free culture and open knowledge activists, video mashup and music remix subculture, the worldwide Wikipedian community, the indigenous peoples networks, the farmers of La Via Campesino, the international water activists, the World Social Forum, which has issued a manifesto to reclaim the commons. These groups are by no means a coherent, united front. If anything these groups are highly eclectic. But they are showing a great deal of energy and innovation….and they do suggest the beginnings of a new sort of global movement. What unites them is a belief in the commons as a new social organism and metabolism for governance and law – outside of the market and traditional government. And the idea of the commons is starting to get some traction in official circles. UNITAR, the United Nations Institute for Training and Research, is launching a new online course on the commons this very week. This should do a great deal to educate people about the commons and galvanize fresh interest in it. A few months ago, the Supreme Court of India officially recognized the rights of commoners to be protected against market enclosure – in this case, real estate development of a village pond. Bolivians have rewritten their constitution to give Mother Nature explicit legal rights of standing to be represented in court – and their president, Evo Morales, is urging the United Nations to ratify a treaty to the same effect. Last November the Commons Strategy Group and I co-organized the first International Commons Conference, in Berlin, with the Heinrich Böll Foundation. The event brought together 200 self-identified commoners from 35 countries around the world – activist farmers from the Philippines, Spanish hackers, Croatians trying to protect their public spaces from enclosure, American academics, the minister of patrimony from Ecuador. 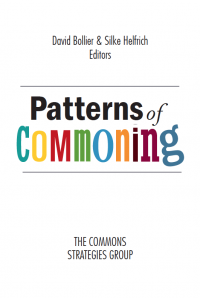 That event released a lot of energy, including a forthcoming anthology of essays about the commons, due out in the spring of 2012. I am currently working with a colleague – Professor Burns Weston of the University of Iowa, a noted international law and human rights scholar – on what we call the Commons Law Project. Our goal is make a strong case for the commons as a distinct governance sector for ecological concerns. We believe the right to participate in ecological commons should be treated as a human right and have the sanction of State and international law. 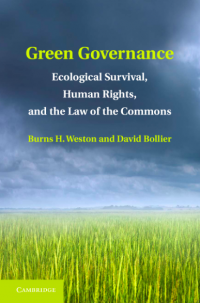 We draw upon legal history of commons law (not to be confused with common law); note the impasse at which current human rights and environmental law are at; point to the deficiencies of the existing order in naming and protecting value; and suggest a new architecture of legal principles and action strategies to advance the commons paradigm. There are several reasons why we should not regard the commons as some utopian agenda or faddish political ideology. First of all, it is not an ideology; it’s a worldview and sensibilitythat is ecumenical in spirit and analysis, if only because no two commons are alike. Second, the commons has a venerable legal history that stretches back to the Roman Empire and the Magna Carta, which is highly instructive for our times…. Third, it is a serious intellectual framework and discourse for critiquing market culture and rediscovering human cooperation and community. As this suggests, the commons has a lot of promising things going for it in a time when the old models are clearly not working. It offers a powerful way to re-conceptualize governance, economics and policy at a time when the existing order has reached a dead-end. It offers a way to revitalize democratic practice at a time when conventional representative democracy is terribly dysfunctional, often corrupt and highly resistant to reform. It shows that societies can actually leverage cooperation, self-restraint and stewardship to help solve problems. For me, the real driving force of the commons is its ability to heal our inner lives and cultivate a new societal ethic. Alain Lipietz, a French political figure and student of the commons, traces the word “commons” to William the Conqueror and the Normans – not the English, interestingly. The commons supposedly comes from the Norman word commun, which comes from the word munus, which means both “gift” and “counter-gift,” which is to say, a duty. I think we need to recover a world in which we all receive giftsand we all have duties. This is a very important way of being human. The expansion of centralized political and market structures has tragically eclipsed our need for gifts and duties. We rely on money and state bureaucracies for everything. And so we forget what Ivan Illich called the “vernacular domain” – the spaces in our everyday life in which humanity once created and shaped and negotiated our sense of how things should be. The vernacular spaces of the commons have been eclipsed by large and mighty institutions that are not easily held accountable, at least to ordinary commoners. But we need these spaces for commoning to exist, and flourish, and be consequential in our lives. What I find reassuring is that this is not just an idle fantasy. It’s happening right now. Around the world. In countless different milieus. And with new convergences and open-ended synergies. When theory needs to catch up with practice, you knowthat something powerful is going on. At a time when the old structures and narratives simply are not working, and exciting new models are spontaneously emerging like green sprouts through the concrete, the commons gives us a reason to be hopeful. And we very much need some good news and reasons for hope. I very much like all what you have written here and in other posts, but I do hope you don't go further in the line that 'gift' and 'counter gift' is 'translated' as duty. Gift and countergift has to do with the dynamic of balancing giving and receiving, which is ultimately related to the essence of being human, which is to be in relationship. That is totally something different than what we normally understand by the word duty. I hope I am clear and that you get my point. Thanks for doing this great work!